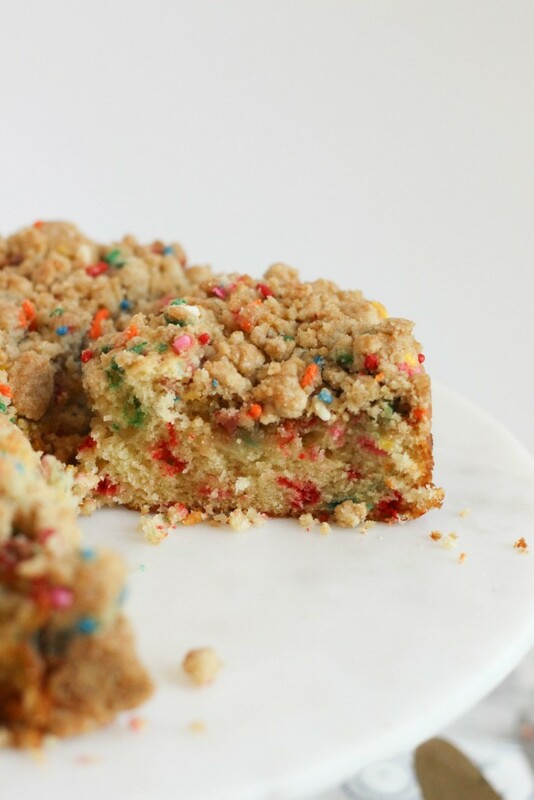 And in other news, today we’ve got funfetti crumb cake because why the heck not? 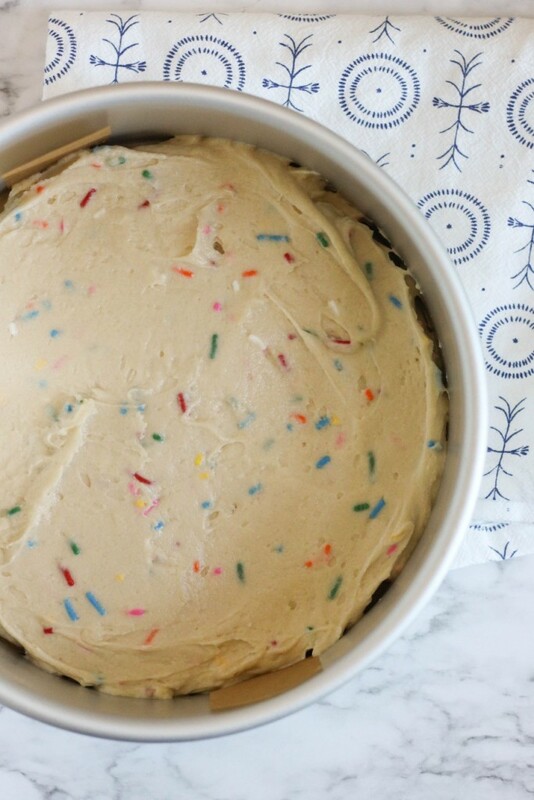 Why shouldn’t we throw sprinkles all over the place I mean, we’re making dessert, right? 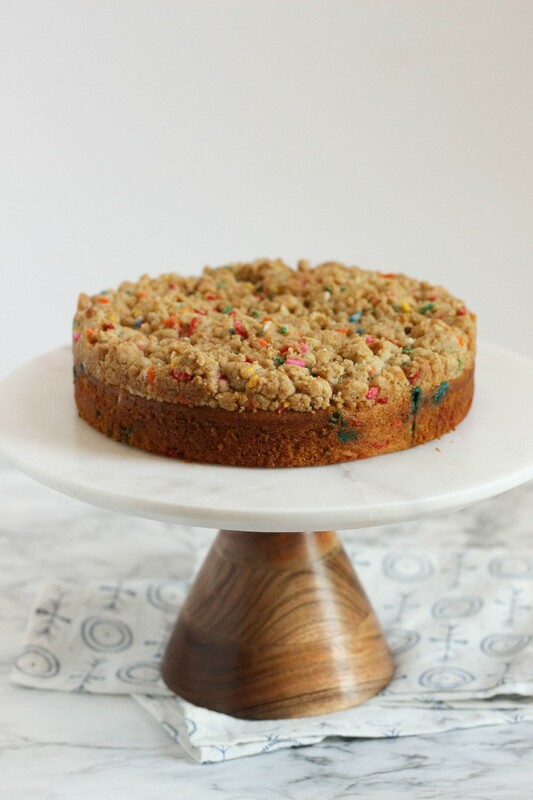 This is kind of my riff on the famous Momofuko cake, and I actually use a variation of their crumb recipe, which you can find at the link above. The cake looks amazing, but also like a few too many steps for me on any given day these days. 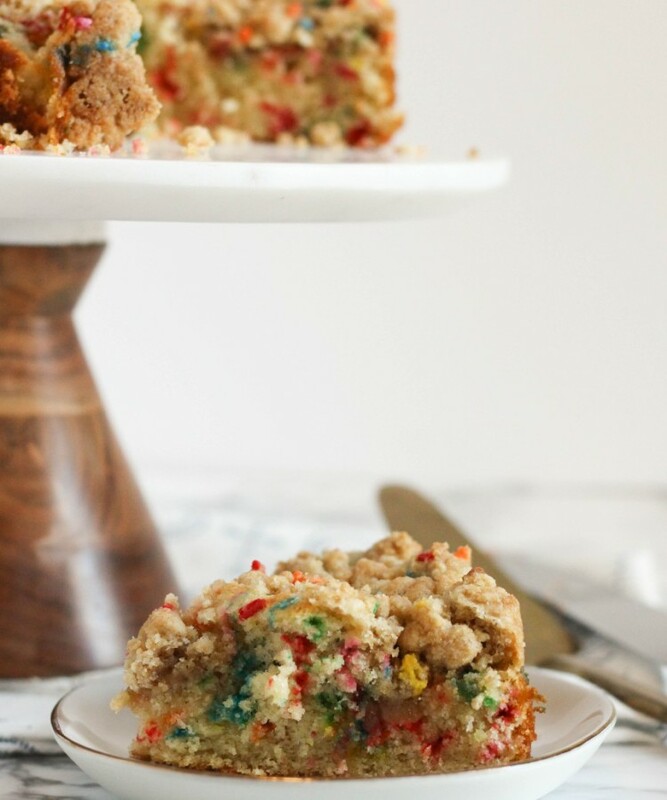 So today we’re making the crumb, and piling it high on top of my own funfetti cake recipe to make something truly delicious. This crumb is substantial and has an amazing flavor you guys. Because it’s a bit heavy, we’re baking the cake for a few minutes on it’s own to keep things from getting too dense. 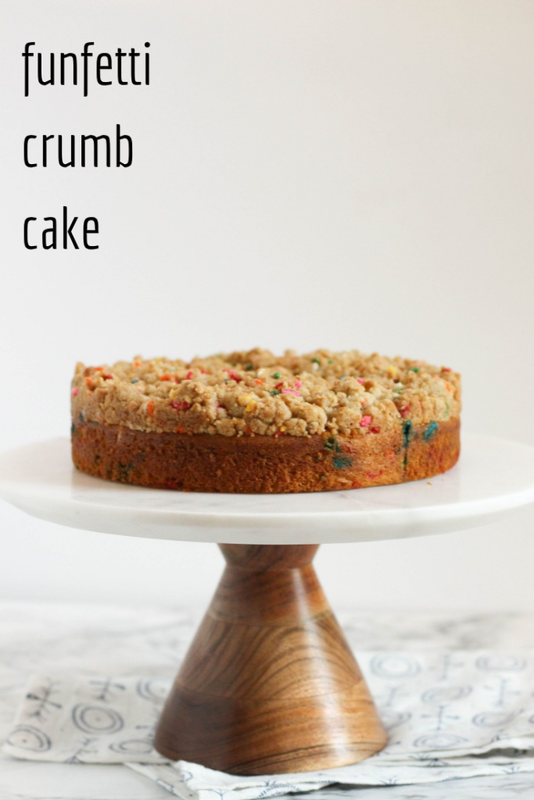 What you’re left with is a fluffy funfetti cake topped with this crunchy, beautiful crumb and it’s great. Great with coffee, great as a lunch-dessert, great as a midnight snack. Preheat the oven to 350 degrees. Grease an 8 inch round cake pan and line the bottom with parchment paper. Set aside. In a large bowl, beat together the butter, sugar, and sour cream until smooth. Beat in the eggs and clear vanilla until combined. 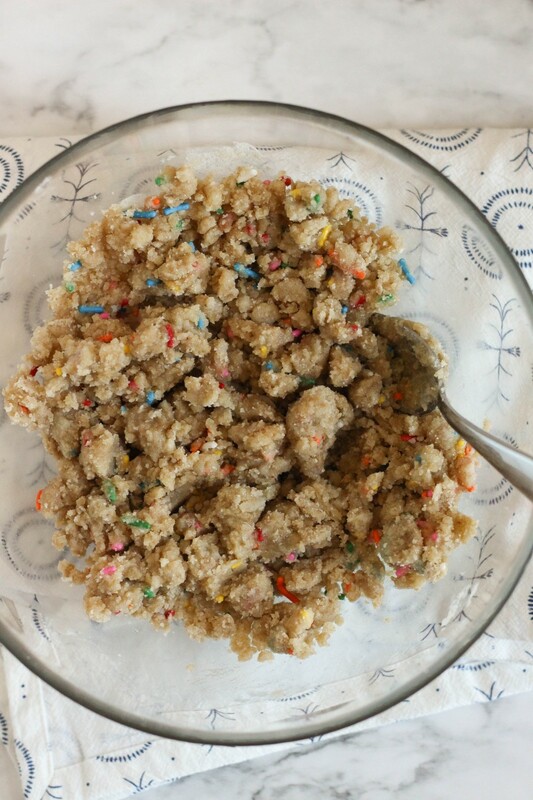 Add in the flour, baking powder, salt, and sprinkles, and beat until combined and smooth. The batter will be thick. Spread the batter into your prepared baking pan and bake for 12 minutes. 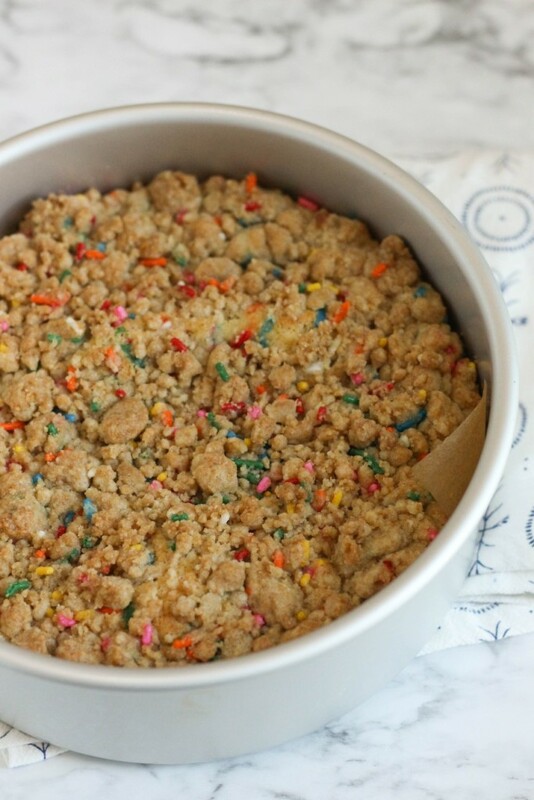 While baking, make the crumb. In a medium bowl, stir together all the ingredients with a fork. If your crumb isn't quite coming together, add a teaspoon of water at a time until you can form large crumbs with your fork. 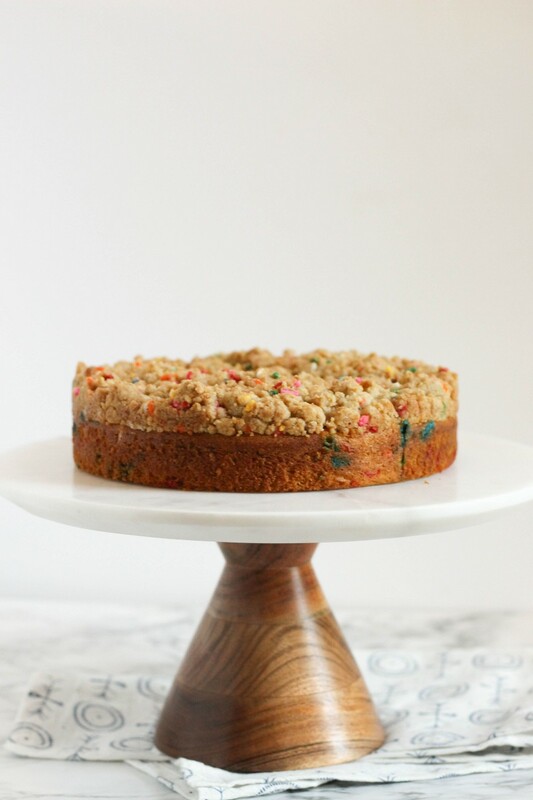 After the cake has baked for 12 minutes, evenly and gently sprinkle the crumbs over the top of the partially baked cake. Return to the oven for another 20-22 minutes, or until a cake tester comes out clean. Cool and enjoy!